Faruq Z. Bey returns with his third effort on Entropy Stereo, Auzar. Auzar features the three horn lineup of Bey, Michael Carey and Skeeter Shelton, representing the first time Bey has recorded with the three horn line up since his days with his seminal Detroit group Griot Galaxy. Representing a clear evolution from Bey’s last two efforts 19 Moons and Ashirai Pattern, Auzar features a unified ensemble sound with an emphasis on unique rhythmic and harmonic possibilities. Bey contributes three compositions to the disc. 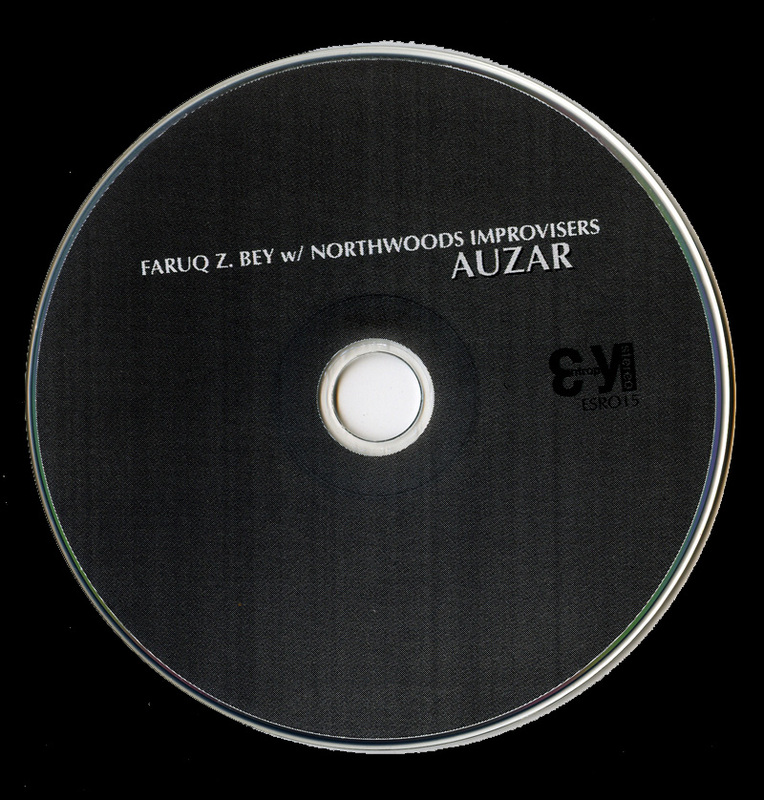 Faruq Z. Bey and the Northwoods Improvisers comprise a natural joining of mind and soul on Auzar in their strongest effort yet. Featuring the composition Zycron by Tani Tabbal. 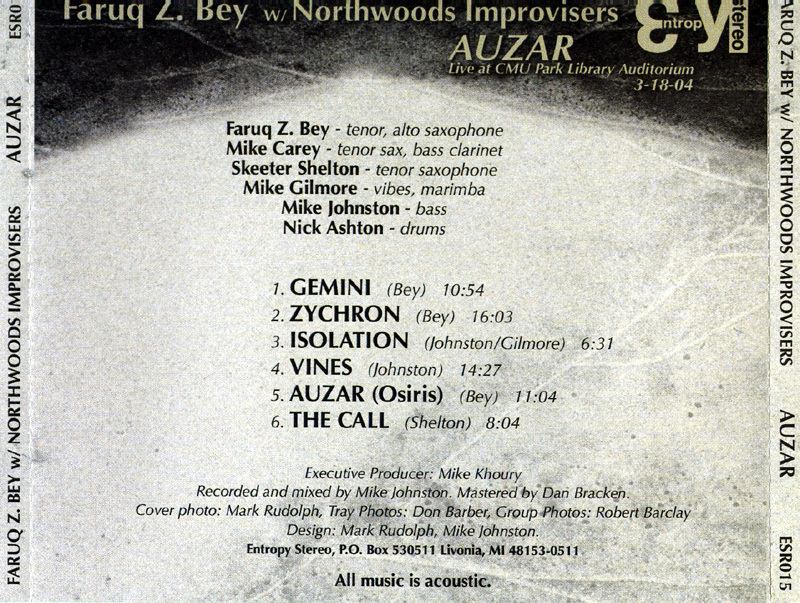 Detroit saxophonist Faruq Z. Bey’s third release with the Northwoods Improvisers, Auzar , may be their best collaboration yet; certainly, it benefits from the addition of fellow Detroiters Mike Carey (on bass clarinet and tenor sax) and Skeeter Shelton (on tenor). These three are ably supported by the core Improvisers lineup of Mike Gilmore on vibes and marimba, Mike Johnston on bass, and Nick Ashton on drums. Auzar was recorded live at Central Michigan University in March of 2004 at a good—and at times great—gig. Lovers of free saxophone playing, especially the “old fashioned kind of modal, spiritual free jazz associated with guys like Pharoah Sanders and Archie Shepp, are going to find much to appreciate in this 67-minute concert. Bey’s definitely the leader here, and you don’t have to be able to see the show to hear him leading the group. That said, all the horns get plenty of space and time. The opening “Gemini has, like much of the CD, a somber, meditative feeling and is based upon a simple triplet motif. Bey, Shelton (both on tenor), and Carey (on bass clarinet) solo in turn over the thick, surging bottom of Ashton and Johnston, who sound like they’ve been playing together for years—which, in fact, they have. The intensity grows from solo to solo, and when Gilmore comes in after the horns to solo on vibes, it doesn’t make much of an impact. Indeed, Gilmore seems at first to be outnumbered and even unnecessary, until one notices that when he lays out completely, the music loses much of its momentum. “Zychron —like “Gemini, composed by Bey—is a cagey, long, two-part tune. The first part features keening, muezzin-like alto from the leader and fine, rough-textured bass clarinet from Carey, everything balanced upon a circular, six-note vibes vamp. Then Johnston’s groaning arco bass leads into up-tempo, almost boppish drumming from Ashton and some explosive, deep soloing from the horns, only to finish light as a feather with Bey breathing out a simple phrase that is repeated, almost chanted , by Carey and Shelton. Sublime. Johnston and Gilmore’s composition “Isolation is an interlude of slow-bowed bass, squeaking, honking horns and spooky, extra-reverby vibes with a blues feel; and if that doesn’t really sound that appealing, let me add that it’s very beautiful. And then there’s the album’s majestic centerpiece, “Vines, a deeply mystical, modal blues dirge built around a hypnotic Gilmore marimba ostinato. Here is where the ghosts of Pharoah Sanders and John Coltrane really come calling (even if Pharoah’s still alive and out there gigging somewhere right now). With Johnston and Ashton rhythmically locked and inexorable, the three tenors solo with yearning, preaching power. One feels that this fifteen-minute track is just an excerpt of a song that goes on forever—and should. There’s more than a taste of Coltrane’s “Alabama here. 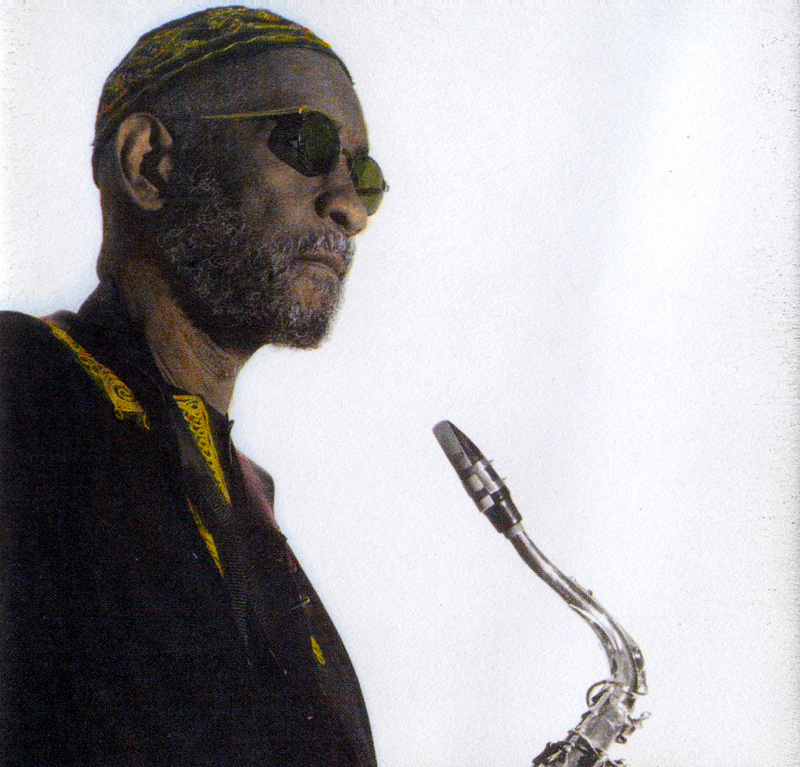 Finally, on the album’s finale, “The Call, the most exhilarating song here, Bey, Carey and Shelton blow free, sounding in the ensemble parts like a flock of gleeful mallards (hey, this is Michigan jazz), the number culminating in a earth-shaking drum solo from Ashton, who, if he’s been a force of rhythmic nature through the concert, now sounds positively unpent: it’s thrilling. This is a live show, and there are moments where it’s not that thrilling; sometimes the collective concentration seems to wane momentarily, and as noted above, when Gilmore lays out, something essential is lost. There’s not that much tonally or stylistically to differentiate the three reeds; they’re sonic triplets on tenor, but this unity of sound usually works to the ensemble’s advantage. Overall, this is a very good CD and this version of the Northwoods Improvisers—with Bey leading and Carey and Shelton added—is a powerful band. Detroit saxophonist Faruq Z. Bey’s third Entropy release finds him returning to a three-horn lineup for the first time since his days with Griot Galaxy. Working a stylistic vein that would have fit ’60’s Impulse! with their bass-driven, Afro-centric, imaginative ardent songs to the sacred, Bey and the Northwoods Improvisers work from compositions, cues, and inspiration. The group sound, captured live, shows an enthusiastic unit capable of infectious grooves and driving without hands. Mike Johnston introduces “Gemini with a lurking solo bass that spooks and runs. Gilmore glimmers the vibes and the ensemble roars in. Bey makes the first tenor solo a meat feast, turning and rolling chunky tones. Shelton’s lighter approach explores sparingly, while Carey slips and slides up and down his bass clarinet. Gilmore hammers out an elaborately graceful lattice work solo before cueing the ensemble to catch the racing rhythm section. Bey’s round alto sweetens the arid exotic “Zychron, composed by Tani Tabbal. Shelton plays soulfully among the modal minors, and after a significant pause, the ensemble returns for another fluid ride with Carey’s bass clarinet. A slow, measured performance, Isolation uses understatement and the band’s textures to create a dreamy, evocative tone. Bey leads the three tenors in an intertwining trio on “Vines. Gilmore switches to marimba while Johnston and Ashton count the miles. All three tenors take ambulatory solos, contrasting the complex beat, but Gilmore dives in with both mallets. The title track opens with an untroubled solo melody line from Bey, before the ensemble joins and settles into the convoluted riff. With Gilmore coloring support, the track has a Jemeel Moondoc feel. Shelton sounds off, and Gilmore finds exquisite decorations for the melody. Shelton’s “the Call follows Ayler-esque structures, the horns whirling before flying free, Ashton burning on drums. Faruq Z. Bey’s Auzur crackles with memorable themes and thrilling variations, revealing a sextet at home with its power.